Create your own egg costume! If you want to add some humor to spring's delightful holiday, you may consider creating an Easter egg costume. This type of costume may be worn for performance, photographs or just plain fun. While there are plenty of Easter costume ideas, including the classic bunny, there's something clearly unique about donning an Easter egg suit instead. Take a look at the following homemade Easter egg costume ideas and get crafty! Clearly not the most common costume choice, an Easter egg outfit is a great way to welcome spring and celebrate the blessed holiday. There are basically two ways to go about donning an egg costume. 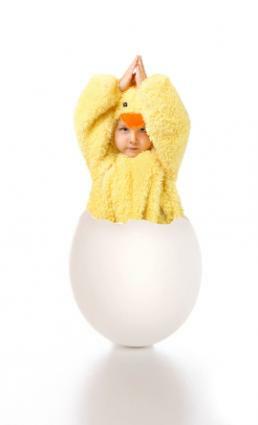 You can either purchase a premade egg costume or try your hand and creativity at creating your own egg outfit. A store bought version may be somewhat expensive, so why not consider the following handmade version and do the job in a jiffy without breaking the bank? The following egg costume can be modified as needed to include or omit materials to your liking. Nearly anyone can wear this costume so long as the materials are sized properly. Make sure the cardboard egg is at a comfortable length for sitting and walking. As with all costumes, be sure to consider safety first. Ensure the egg presents no tripping, choking or vision impairments. Cut both pieces of cardboard into an oval egg shape. Create a jagged top by cutting inverted triangles at the top of the oval shapes to recreate a "cracking" shell. Punch holes on both sides at the top of the ovals and tie twine to connect the cardboard pieces together. Your head will slip into the top of the cracked shell. You may find the need to add additional holes at the sides of the shell to secure twine at the waist as well. Paint the oval pieces of cardboard with an assortment of pastel paints. A baby blue or lavender hue is the perfect choice for the body of the shell, while accent colors may include shades of yellow, orange, green or pink. Be sure to create lively designs on your shell by including lines, dots and swirls. There is no right or wrong way to color your egg, so get creative! Once the egg is painted and dried thoroughly, you can begin to assemble your outfit. This costume idea is meant to recreate the look of a chicken busting out of its shell,hence the need for yellow face paint and yellow accessories. For the body of your chick costume, opt for yellow tights or sweatpants and pair with orange slippers or thick socks to create chick's feet. Don a yellow shirt in the closest shade to your tights or sweatpants. Apply yellow face paint liberally. Top your chick head with a pastel colored straw hat in a color that coordinates your painted egg. Wear an orange beak for best results.Beaks can be purchased at any party supply store and may be painted orange if need be. Slip the cardboard egg atop your head and get ready for giggles! International Fun Shop - Paired with a simple black unitard, this egg costume is perfect for adults. Oriental Trading Company - Available in an assortment of children's sizes, this easy to wear pastel egg costume is an economical choice that looks comfortable to wear. Costume Discounters - While this sunny-side-up egg costume is already cracked, you can adhere small felt shapes as needed to the body to create polka dots instead, making it an easy pass for an Easter egg outfit in a jiffy. Dressing up like an Easter egg can be a great way to entertain the kids at your family gathering. Whether you buy a costume or make one, get into the spirit of the occasion and have fun with it.